Heat oven to 350°F. Cook broccoli as directed on package. Drain. Place in ungreased 12x8-inch (2-quart) glass baking dish or 2-quart casserole. Drizzle with oil. Sprinkle with 1/4 cup of the cheese; toss to coat. 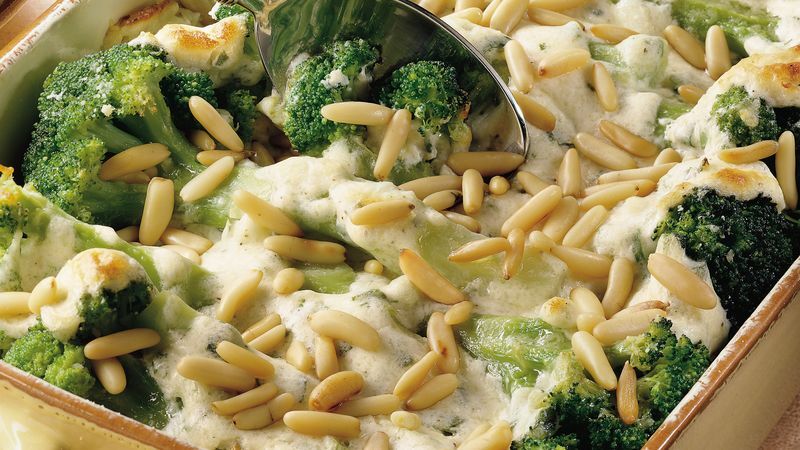 In medium bowl, combine remaining 1/2 cup cheese and all remaining ingredients except pine nuts; mix well. Spoon over broccoli. Bake at 350°F. for 18 to 20 minutes or until sauce begins to bubble and brown. Sprinkle with pine nuts. * To toast pine nuts, spread on cookie sheet; bake at 350°F. for 3 to 6 minutes or until light golden brown, stirring occasionally.